Captains Cottage Chefs Kitchen with marble countertops Dining Livingroom Sitting area Master bathroom. Master with King Guest bathroom Guest Bedroom with twin beds. Queen guest bedroom. Master shower Cape Porpoise Pier Lobster boats on the harbor. Lobster anyone Sunset over Cape Porpoise Harbor. 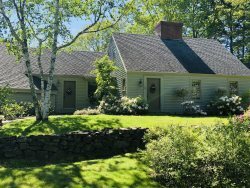 Fully renovated with to the highest quality this 3 bedroom, 3.5 bathroom designer home is located in Cape Porpoise. it offers an open floor plan with high quality furnishings. Enjoy walks along Cape Porpoise Harbor, Goat Island Lighthouse, local restaurants and shops. Take a short drive into Dock Square, Goose Rocks Beach, Gooch’s Beach and Mother’s Beach.